While not being very practical for severely disabled people, scooters are a godsend for those who want some independence outdoors and either can't walk or have health problems which limit the amount of walking they can do. People with, heart problems, lung problems, arthritis, balance problems, muscular problems or endurance issues will allbenefit greatly for the use of a scooter. Scooters mean different things to different people but in the home health care industry and for the purposes of this web site the scooters I'm writing about are three or four wheeled battery operated machines that have a seat for sitting on and a tiller for steering. Because of the design, people who wish to use a scooter should be able to stand well enough to transfer onto it, have at least one arm which is functional enough to turn the steering tiller and operate the speed and direction controls. People who don't fit into this criteria should seriously consider a power wheelchair for their mobility needs. Mobility Scooters have a speed control lever of some type which works similar to the gas pedal in a car; meaning the further you push or pull the lever the faster the scooter will move. This speed control lever which is operated with either the fingers or thumbs also determines whether the scooter moves in a forward direction or a reverse direction. In addition to the speed and direction lever on a scooter there is usually a speed dial on the control console at the top of the tiller which will limit the maximum speed the scooter can be driven. In extreme cases where the user may be a danger to themselves or others, a scooter dealer should be able to limit the speed electronically with a hand held programmer. Scooters have a couple of built in features to help keep the user safe. One is that the brakes are automatic meaning that, the brakes are always on unless the speed control lever is moved and when the user wants to stop they simply release the speed lever and the scooter will stop. Another feature of the brakes are they will prevent the scooter from going over the maximum set speed when the electronics of the scooter sense an increase of speed due to driving down a hill. The brakes will have a release lever which will allow the scooter to be pushed in situations where it won't drive on it's own however if the brakes are disengaged, the scooter won't drive until its re-engaged. One other small feature is the scooters go slower backwards than forward. The reverse speed is normally a percentage of the forward speed. Three wheeled scooters have a couple of attributes which four wheeled scooters don't. 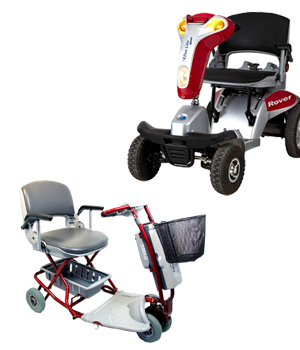 They are a bit lighter and have a much smaller turning radius than a four wheeled scooter making them much better for use indoors in such places as malls, stores, apartment buildings and retirement homes. On the other hand, four wheel scooters are more stable, have a larger area for the user's feet and perform better in rough terrain. All scooters operate on battery power and nine times out of ten will have two 12 volt deep cycle batteries wired in series to provide 24 DC volts to the electronics and motors. Deep cycle batteries are designed to provide a small amount of power for a long time and discharge quite a bit between recharging. I've had clients try and save a few dollars by buying batteries which aren't deep cycle for their scooter but these batteries are designed to provide a lot of power for a short time, such as when starting a gas engine, and not discharge very much. The end result is, these "cheaper batteries" are worn out within months and never give very good performance. Taken care of properly, scooter batteries should last two to three years. Regardless of whether the scooter is three or four wheel, the optional equipment is pretty much the same. Rear view mirrors, baskets, lights, signals, cane & crutch carriers, swivel seats, flip up arms, adjustable tillers, safety flags, flat free tires and headrests are all features available as either options or standard equipment on most scooters. Many scooters are promoted as easily disassembled for transporting but to be honest, very few people are able to, or want to, disassemble their scooters let alone lift the parts into a vehicle and the reassemble the scooter when reaching their destination. For transporting scooters, most people use a scooter lift or carrier of some sort.